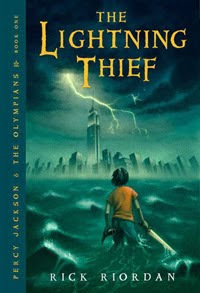 The Lightning Thief by Rick Riordan is a book that is fast paced and full of adventure with a pinch of suspense. This book is about a young boy named Percy who has always had trouble in school and has had some anger management issues. When Percy unleashes strange and unusual powers, he is taken to Camp Half-Blood. Within the camp, he learns things about himself that will blow your mind. Personally, I thought that this book was a very well written book with lots of movement flowing throughout the book. There was lots of action, suspense, and heroic and epic endings. There were some negatives though. Within the time when Percy learns who he really is, the author can be unclear when explaining things. Altogether, I would give this book five stars. For people who love action, suspense, and mythology, this book has been written for you. Also, if you love this book be sure to checkout the rest of the series below.